This book is the catalogue for an exhibition at the San Antonio Museum of Art. 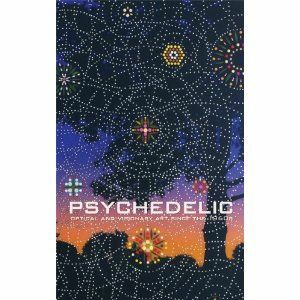 According to the blurb on the inside of the dust jacket “This eye-popping book offers a visual history of the psychedelic sensibility”. It contains a selection of seventy four colour plates of images from the exhibition and three essays, and uses selected images as ‘wallpaper’ to divide the sections and as endpapers. I very much enjoyed reading this book, though at times I wish that the book was bigger as detail in some of the images is missed at this size (even though at 30 x 20 cm it is not small by any means). The book’s foreword suggests that now is an appropriate time to present this work – our “nirvanic times” that echo with the spirit of the 1960’s. Whether you agree with this or not, the book is a useful gathering of work that shares a particular aesthetic. The first essay, an overview with a running commentary for each artist, serves as useful scene setting for the scope of the book allowing David Rubin, the curator of the exhibition, to “investigate the notion of a psychedelic sensibility within the context of contemporary art”. I found it very interesting and helpful to see how and why different artists came to make their work, and to touch on the wide range of historical and cultural antecedents to this work, for instance, shamanism, mathematical models, Buddhism, the digital revolution, science, pointillism to name but a few. As far as commentary goes, I found Robert Morgan’s essay the most insightful and balanced. Much of the discussion and content of the book is US biased, but Morgan widens the context to European traditions and tackles the sticky question of how far “mind expanding art” is able to transmit a given meaning, citing Duchamp’s suggestions that the art object may not be interpreted or experienced by an audience as the artist intended (seemingly in contradiction to Rubin’s concluding remarks above). He also tentatively suggests a useful framework for grouping the work within the book into the broad categories of visionary, optical and narrative/allegorical (expressing lived or subconscious experience). The essay by Daniel Pinchbeck was the most problematic in my view due to its gushing style and absorption in its concern with the importance of psychedelic drugs. He claims that we are on the verge of a revolution of consciousness (he is the author of a book on the Mayan prophecies for 2012). In two years time come back to me if he is right (if we are still here) but the big problem in my opinion – and this may apply to some psychedelic art – is that the intense nature of hallucinogenic experience may allow the user to see things clearly but this may not (as Morgan pointed out) be as clear to everyone else. Issues about misuse or misunderstanding of drugs in the West may further alienate those who are not converts already. Whilst I agree with some of what he suggests, his occasional sweeping statements do not help his arguments and his citing of research by Dr Alexey Dmitriev for example, that our galaxy is passing through an intense field of cosmic rays causing planetary pole reversals to support his ideas about “the end of ego-based materialism”, is likely to switch off more sceptical readers. However, I do get fed up sometimes with dry, rationally balanced arguments and part of me wonders if perhaps Pinchbeck is right that we do need an almighty kick up the derrière and a radical re-feeling rather than a re-thinking to do something to remedy the ways that humans have trashed the world. In conclusion then, I would recommend this book to anyone interested in altered states and layers of the psyche and how these manifest through art. Some of the images are intriguing and visually arresting and the written commentary, whilst limited in some ways, offers a good overview of the historical and cultural contexts of the artworks. I would have liked to have read more on the links between this ‘genre’ with other forms of religion, art, culture and even mental illness, rather than delineating it as a distinct historical movement, but I guess without this coinage the exhibition would not have happened in the first place. And if we buy into Pinchbeck’s ideas, this is part of the revolution!